Lightly oil and flour 3 (9 by 1 1/2-inch round) cake pans. Using a standing mixer or hand Mixer, mix the dry ingredients into the wet ingredients until just combined and a smooth batter is formed. Place the pans in the oven evenly spaced apart. Bake, rotating the pans halfway through the cooking, until the cake pulls away from the side of the pans, and a toothpick inserted in the center of the cakes comes out clean, about 30 minutes. Remove the cakes from the oven and run a knife around the edges to loosen them from the sides of the pans. One at a time, invert the cakes onto a plate and then re-invert them onto a cooling rack, rounded-sides up. Let cool completely. Frost the cake. Place 1 layer, rounded-side down, in the middle of a rotating cake stand. May be stored in the refrigerator for 3 days. The Cakeman Raven...this is an awesome red velvet cake recipe. 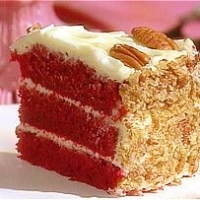 I've seen the cakeman make this cake on The Food Network several times, probably one of the best red velvet cakes yet. I made this cake for Christmas and my husband and I are sooooo pleased. This is my third attempt to make a red velvet cake and this recipe is the BEST. It's so moist and rich and I can't wait to make another one. 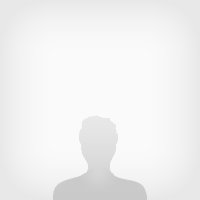 Thank you for sharing this recipe and I've added it to my collection. Thanks!!!!! this is a fiver, that is for sure. I made this for my daughter when she was home and she loved it. This is very similar to a recipe I got from Cake Man Raven's website. It's delicious!!!!!!!! I made this cake for my son's birthday and it was a huge hit. I even sent some of it to my neighbor and she told me it was the best Red Velvet Cake she ever had. She ask me to make her one for Christmas, and said I should actually be making them to sell. Wish I could give you 100 for it, but you do have my 5 forks. Thanks so much for sharing this recipes here. This cake was one of my first I ever made. It has always been one of my favorites. It was my grandmother's recipe, but her frosting was made with flour! (And it is yummy.) She would always sprinkle coconut on top of her red velvet cake/frosting. I will be adding my (her) recipe soon. so love red velvet cake gonna try this one grandkids will be happy ha. I can't wait to try your recipe! I love red velvet cakes and always wanted to try making one but never had a decent recipe until now! Thanks so much for posting this recipe. WOW - this is decadent!